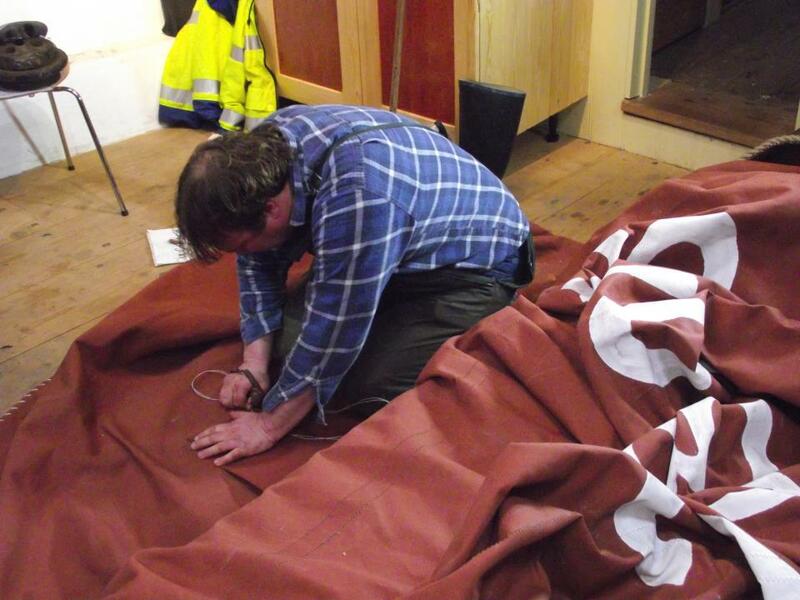 We posted here on Saturday about sailmaker Steve Hall’s visit to Cambria at Gravesend to repair the topsail. Film maker, Simon North, was there and has now published this great video of Steve at work. Not only does it show his great skill, but he talks about his life as a sailmaker. He tells us that it took a bit over three months to make the sails for Cambria, and that he has been sailmaking ever since leaving school. It even has my own dulcet tones asking a couple of questions. It was a really cold, wet day, and as we sat aboard Cambria waiting for the Gravesend crowds to come and view her, we were not that surprised that they didn’t flock down on to the new pontoon. Some came, a few brave souls with children wanting to see what it was all about. And then, about 4 o’clock my day was made really worthwhile. Cambria had a tear in her topsail that needed to be repaired before she goes back to Faversham at the end of the week, and she was expecting the sailmaker. A dripping wet figure in wellies and waterproofs descended the ladder, and it was Steve Hall the sailmaker from North Sea Sails of Tollesbury. He is one of the very few traditional sailmakers left. He set to work, expertly measuring the size of the piece of canvas he needed, cutting it, and then sewing it neatly into place with small, regular stitches. This all done on the splendid topsail that he himself had made not that long ago. He made it look easy, but it’s only easy if you know how and have years of experience. And all the while he talked in the wonderful real Essex tones, (not that rubbish you hear on TOWIE and similar programmes, which is actually part London and part transatlantic TV speak). We had a long discussion as fellow enthusiasts of Jeeves and Wooster, but Steve’s much better at it than I am, and can quote reams of it. And I felt then as I watched him, and I still feel now, that I have been truly privileged to spend the afternoon in the company of a master craftsman and watch him at his work.